Growing up, college never occurred to Laura Varela. Her parents barely finished middle school, and like most of her friends, she assumed she’d graduate from high school and find a job to pay bills. 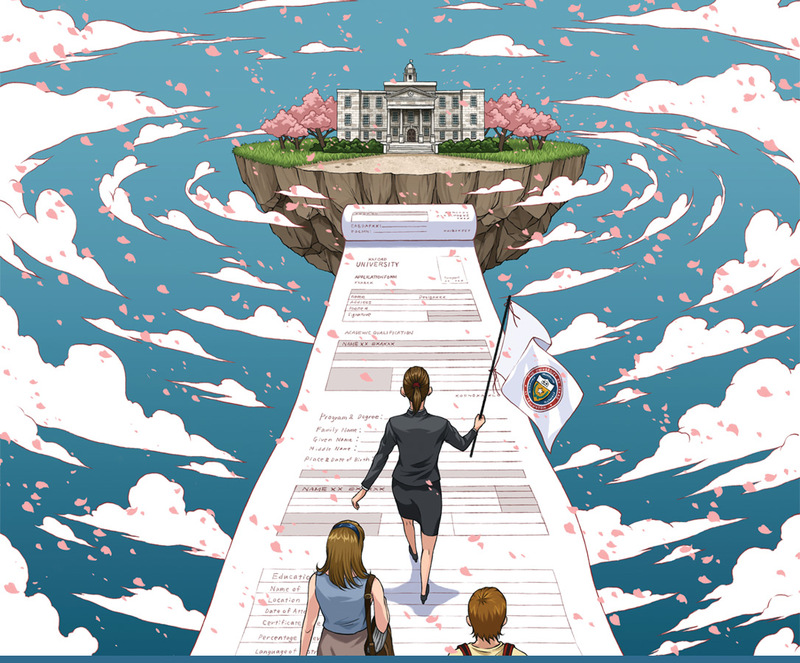 But a school counselor saw potential in the teenager and suggested she consider college—even helped guide her through the sometimes laborious admissions process. Now a UT Arlington student, Varela helps teenagers forge a path to college as a mentor at Lamar High School in Arlington. Through its Bound for Success, GO Centers, University Crossroads, and other programs, UT Arlington provides avenues for promising high school students to complete their studies and pursue a degree. Many of these students come from low-income families, historically underrepresented among university populations. At a GO Center in Mansfield, Rebecca Esposito counsels Abigale Standefer, a high school junior interested in UT Arlington’s nursing program. According to the Pew Research Center, college enrollment among low-income students increased over the past several decades, but the 2007-09 recession eroded recent gains. In 2012, 50.9 percent of low-income high school graduates enrolled in a two- or four-year college. Enrollment among middle- and high-income students grew to 64.7 and 80.7 percent, respectively. Established in 2013, Bound for Success aims to close this gap. A partnership with the Arlington, Grand Prairie, and Mansfield school districts, the program provides deferred, unconditional admission to high-achieving high school graduates, as well as advising support to help students prepare for college. The collaboration seeks to strengthen local communities and the workforce while increasing opportunity. Alumna Rebecca Esposito sifts through papers on her desk at Mansfield High School, reviewing student records. She is one of nine Bound for Success counselors who meet with students to discuss their options, organize financial aid workshops for families, and arrange campus tours. Some of the students already plan to attend college; others are unsure. Esposito ’10, the first in her family to attend college, can relate. Bound for Success, which launched in Arlington schools and expanded to Grand Prairie and Mansfield in 2014, is tailored for each district. In Arlington and Mansfield, the program serves high school students ranked in the top 25 percent of their class and offers them early admission to UT Arlington, provided they earn a high school diploma. In Grand Prairie, Bound for Success serves every junior from three high schools, with requirements based on class ranking and SAT or ACT scores. Students in the top 25 percent of their junior class receive deferred, unconditional admission. Those outside the top quarter may earn admission by meeting minimum SAT or ACT scores and other criteria, such as earning credit through the Tarrant County College or Dallas County Community College districts. University Crossroads’ SAT math workshop helps students sharpen skills. More schools and districts could join Bound for Success, says Dara Newton, who oversees the program as UT Arlington’s recruiting director. Western Hills High School in Fort Worth recently signed on in a pilot program, and University leaders have fielded interest from other districts. 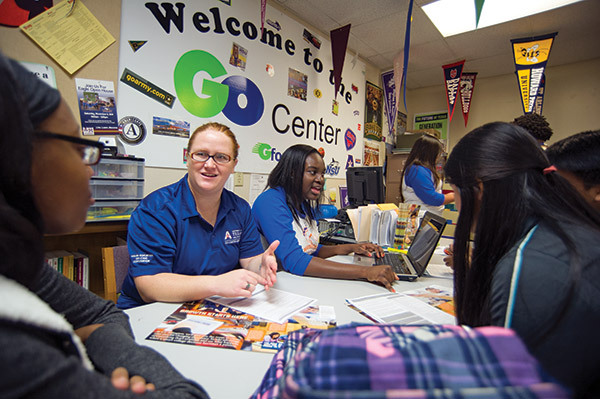 Begun six years ago by the UT Arlington College of Education’s Pathways to College Access and Career Readiness, GO Centers are housed at 16 high schools in Arlington, Fort Worth, Everman, Mansfield, and Grand Prairie. About 50 student mentors offer tutoring, assistance with college and financial aid applications, and résumé and career counseling, among other services. The centers received more than 27,000 visits during the 2013-14 school year. Alicia Hooper, a graduate student in social work, and Abby Dansoa, a nursing junior, mentor students at a GO Center. Like Varela, many of the mentors are bilingual and first-generation college students, and they’re encouraged to share their personal stories. Giselly Cobas-Rincon thought her dream of earning a college degree had ended. Two months shy of graduation in 2007, she was forced to leave her family and flee Cuba for political reasons. Settling in Dallas, she assumed a degree was out of reach. Then she met Michele Bobadilla, UTA’s senior associate vice president for outreach services and community engagement and assistant provost for Hispanic student success. Bobadilla also co-founded University Crossroads, which works to expand access to higher education for first- and second-generation college students. She helped Cobas-Rincon enroll at UT Arlington and secure scholarships and financial aid. The political science major plans to graduate in May and hopes to work in public policy or immigration. Cobas-Rincon is one of more than 33,000 students helped by University Crossroads, a UT Arlington outreach based in Dallas. The organization offers free SAT math preparation courses, writing and financial literacy workshops, and college fairs and community expos, as well as office and meeting space. Bobadilla says the test preparation courses have proved particularly successful. Students who attend at least three classes typically increase their SAT math score by 70 or more points. She notes that the state’s rapidly changing demographics, including the growing Hispanic population, make University Crossroads and other such initiatives critical to student success and economic prosperity. Cobas-Rincon credits UT Arlington and University Crossroads for her rising arc.